When boxing first appeared in the Olympics in 688 B.C., Greek fighters wrapped their hands with oil-softened oxhide leather strips called himantes. Those evolved into a cestus, which is the ancient form of a boxing glove as we know it today. They were made with strips of leather that were occasionally fitted with blades or spikes. They were more like weapons than sporting goods. Although they have radically evolved and improved, the first “padded” boxing glove was introduced in 1743. At that time, the padded gloves were only used in training. For the next decade or so, the use of “mufflers,” as the gloves were called, was considered unmanly. They slowly gained acceptance as more structured rules and safety measures were adopted by the sport. The boxing glove today is obviously much more advanced and regulated. The weight, design and amount/type of padding is carefully considered. In today’s boxing game, training and sparring gloves are tailored toward protecting the fighter AND his/her opponent. 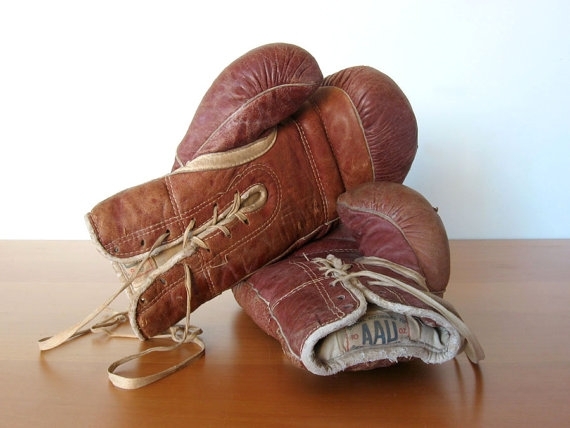 Originally most boxing gloves were made of brown or natural, tan leather. They weren’t dyed until the early fifties when boxing was entering its heyday on network television and, even then, it came about for reasons of function, not fashion. Gillette Friday Night Fights became wildly popular and boxing gloves transitioned into an oxblood red color. This shift was to hide blood “soften” the images for TV audiences and reduce the perception that boxing was too violent. 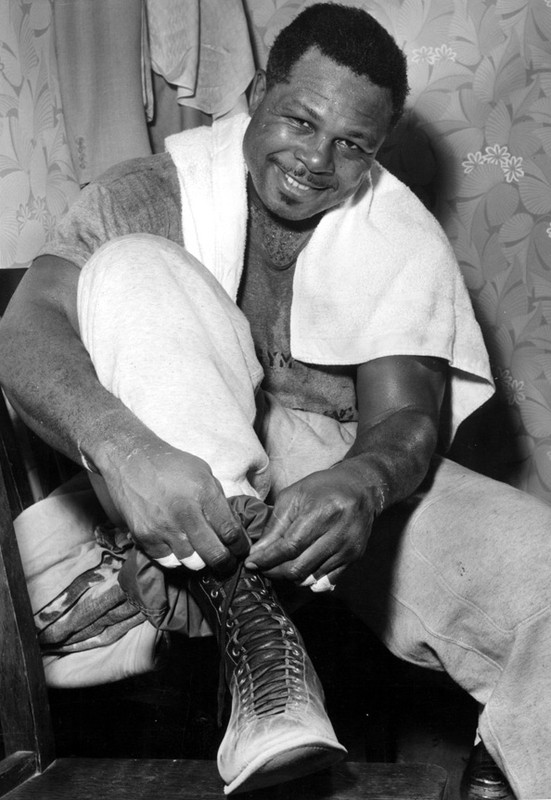 Original boxing shoes were constructed of genuine leather and featured smooth soles. You may have seen old fight footage of boxers stepping into rosin boxes in their respective corners to lessen the slippery bottoms of their soles. Modern day boxing shoes are now built with a variety of nylon and breathable mesh fabrics. Some are even cut taller for more support and feature textured soles that provide more traction in the ring. In the late twenties, the first groin protector was introduced. It was called a “Taylor”, named after Brooklyn shoe sole manufacturer, James P. Taylor. His invention didn’t take hold until the results of the Max Schmeling versus Jack Sharkey fight in June 1930, which ended in a disqualification. 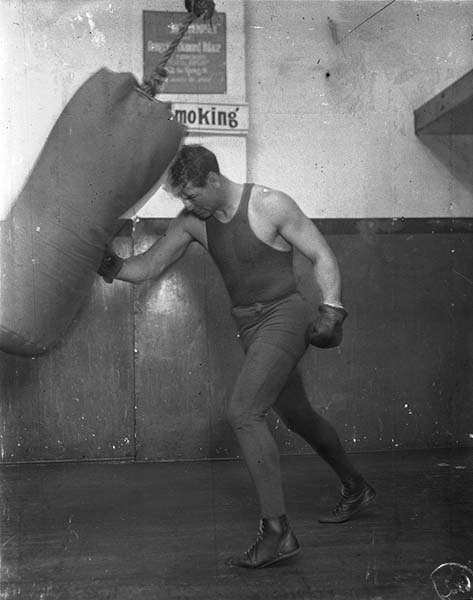 Sharkey lost due to a controversial “low blow” which gave Schmeling the win and gave the United States a German Heavyweight Champion. After that bout, “No Foul Rules” were introduced and Taylor’s No Foul Protector was adopted across the US boxing landscape. Today’s groin protectors provide more complete protection with advanced, closed-cell foams and fuller cups. Contemporary designs cover the hips, groin and upper abdomen to a greater degree than they did in the past. Although some fighters may have used rudimentary mouth protection made of cotton, strips of tape, a small sponge or pieces of wood clenched between their teeth, the first modern-day boxer known for wearing a gum shield was Ted “Kid” Lewis. Lewis’ friend worked in a dental laboratory and created a rubber shield to help protect him from the re-occurring injuries to his teeth and gums he was experiencing. Lewis used the first rubber version of the mouthpiece in his 1921 championship fight against Jack Britton. Since that time, mouthguards have become a standard in many sports, but boxing certainly led the way. While still an up-and-comer, Jack Dempsey called on a local sporting goods manufacturer and its owner Jacob Golomb to construct a protective headgear that would stand up to more than fifteen rounds of intense boxing training. Although the company had only made swimwear up to that time, they were able to construct a durable and long-lasting headgear for Dempsey and, subsequently, all of his predecessors. Headgear has made some huge advancements since that time, with multi-layer padded systems to absorb shock and more comprehensive designs that provide a greater degree of protection for the chin, nose and cheeks. Aside from ancient gladiatorial games, the first documented case of a modern day fighter using any type of equipment to punch in training is in the late 1870’s when Middleweight Champion Mike Donovan was seen hitting a rugby ball he had hung from the ceiling. His device was quickly adopted by other fighters and over the subsequent 10-15 years, punching bags evolved and took on many forms. Its most recognizable descendant is the double end bag, which gained widespread popularity in the 1950’s when combination-puncher Sugar Ray Robinson was seen working this piece of equipment with masterful speed, timing and fluidity. The only difference between Donovan’s original creation and the more modern day double end bag is that today’s bag is attached to the floor by a rubber cord limiting its range, movement and subsequently creates a bag that requires a faster response time. The other piece of equipment most likely derived from Donovan’s rugby ball contraption is the contemporary speed bag. It’s obviously similar in function. It provides the same type of head target and bounces back, but with the inclusion of a swivel and platform. This “spin-off” innovation requires quicker reaction time and is geared more toward developing reflexes. The more modern version likely began in the early 1900’s when Jack Johnson was first seen using this type of bag, although it was much, MUCH bigger back then. The use of punch mitts or “focus pads” likely came about as Muay Thai and Far Eastern martial arts made its way toward the United States in the late 1700’s. The concept first began with martial artists using foot tongs or slippers on their hands to absorb the impact from kicks and strikes. The earliest photos or documentation of punch mitts came about around the time of Joe Louis. Modern day punch mitts came into more widespread use in the mid-1960’s when Bruce Lee was seen using them in his training routines. Although they have been around for decades, they were never a central part of coaching until the late ‘70s and early ‘80s. Now they’ve become an almost irreplaceable part of a fighter’s routine. The traditional heavy bag, as it looks today, gained popularity around the 1920’s. Heavy bags were originally constructed from old duffle bags or cloth “gunny” sacks and were initially filled with horse hair (like early boxing gloves), sand or grains. Heavy bags have advanced greatly, with genuine leather and synthetic materials that now last much longer. They are specifically made to withstand round after round after round of action and power-punching. Although painted images of skipping bamboo and vines date all of the way back to Egyptian times (around 1600 B.C. ), Dutch settlers are actually credited with bringing the jump rope to America during the 1600’s. The activity thrived early in the ‘40s and ‘50s, predominantly with children in inner cities, because it was inexpensive and could be taken anywhere for fun. In the early 20th century, boxers began using ropes in training to improve conditioning, leg strength and foot speed. When Heavyweight Champion Sonny Liston appeared on the Ed Sullivan Show in 1963, skipping rope to the song “Night Train”, the jump rope surged in popularity and became a staple of every fighter’s routine. Jump Ropes were primarily constructed of leather but now use a variety of dense rubber materials and plastics. Many feature ball bearings in the handles that increases the rope speed and decreases wear at the point of rotation. One of the oldest and earliest pieces of equipment, the medicine ball, dates back to ancient Greece. At that time medicine balls were made from pig bladders or animal skins filled with sand. 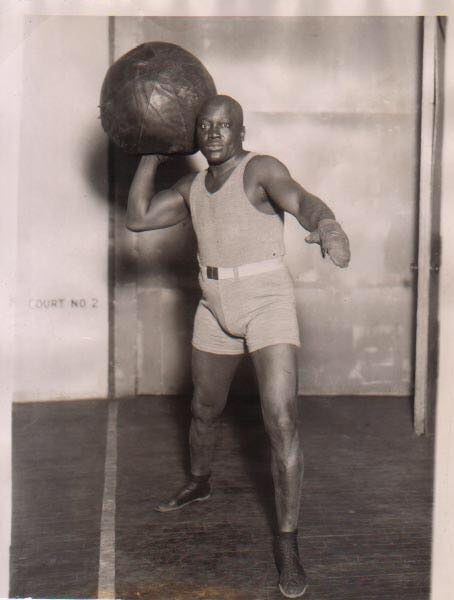 In more modern days they were a prominent fixture in Heavyweight Champion Jack Johnson’s training routine. 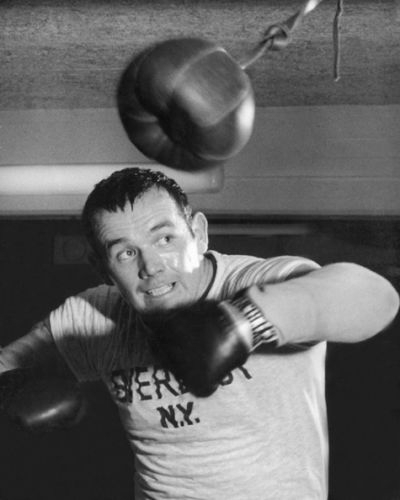 Since that time, nearly every recognizable fighter, from Sugar Ray Robinson to Sonny Liston has had a medicine ball thrown at their midsection, tossed it back and forth to a partner, jumped with it, ran with it, punched at it or in some way incorporated it into their routine. The Medicine Ball has become synonymous with boxing training and enhances total body power. It demands use of all of the muscles together to generate maximum force and is sill “the prescription” for better health and overall peak physical condition. When gloves of "fair size" were declared by the Marquess of Queensberry Rules in 1867 greater precautions started to develop that better protected both combatants. Fighters pre-wrapping their hands beneath the gloves evolved over time but came into full use in the 1920’s when use of gauze and tape became standard practice.